As a guest you can expect high comfort and luxury. This is the premise of the Livingstone Jan Thiel Resort. We offer a pleasant accommodation and stay thanks to our well-equipped houses and unique intimate atmosphere of our park. Guests have free entrance to the luxurious Jan Thiel Beach and Jan Thiel Plaza (2 min walk). This beautiful center offers everything you could wish for: a spacious beach, various lounge beds, luxury beach clubs, restaurants, health club, several shops, a casino, ice cream parlor and a spa. 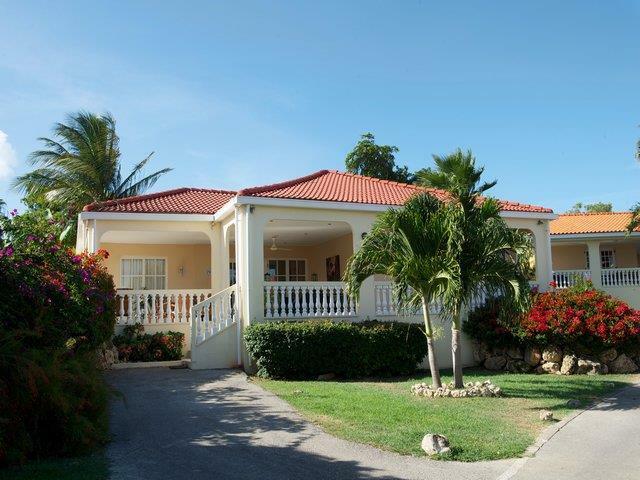 Our 3-room villas are perfect for a tropical vacation with all the comfort you are used to at home. The villa is completely detached and the lush garden around offers maximum privacy. Your villa has a living room with a sitting area, cable TV and ceiling fan. There are 2 bedrooms. Both bedrooms have a king-size bed and air conditioning. The bathroom has a shower and bath and there is a separate toilet. There is also a fully equipped open kitchen with dining table, a 4-burner stove, combi microwave, coffee maker, kettle, fridge with freezer, dishwasher and all cooking utensils. Outside you can relax on your large veranda with comfortable lounge set and a table with chairs. Have you rented a car during your vacation on Curaçao? Then you can easily park it on your own private parking space. You can also use free Wi-Fi in your villa. The villas are equipped as standard for 5 people. An extra bed will be placed in the livingroom for the 5th person. Do you want to stay with a baby in a villa ? Then you can have a high chair and baby bed in your room, subject to availability and for a small extra charge. We advise you to mention this in the making of your booking. 3-room villa for 5 people Spacious apartment of 145 m2 Livingroom with sitting area 2-bedrooms Fully equipped kitchen and dining table 1 bathroom with shower & separate toilet Large veranda overlooking the tropical garden Private (free) parking space Free Wi-Fi communal pool 24h security walking distance from beach, shops and nightlife children under the age of 12 are free if no extra bedding is required At Key Caribe we pride ourselves on your satisfaction and you can be rest assured knowing that our accommodations are suitable for a range of people. Our properties are all close to the beach and local tourist's amenities such as bars, restaurants, cultural activities and much more. The unit was very clean and fairly comfortable, but we had several issues. The unit was described as having air conditioning; in actuality, only the two bedrooms had air conditioning. The living room had a ceiling fan with a regulator switch; however, even the lowest setting was extremely fast and made it uncomfortable to stay in the room too long. The coffee maker did not work. The door lock was not explained to us, and we had to have the manager come out and show us how to lock is (you have to raise the handle first). The second bedroom did not have an en suite toilet, and the one in the hallway was extremely small. There was not view at all, you just looked out over some bushes. The driveway was very short and steep, and you could not park more than one car there. Bathrooms need maintenance: change out the mixing valve in the main bedroom, and fix the drainage problem (standing water) in the second one. 1. The air conditioner in the small bedroom weeped a steady stream of condensate on the bed. It was repaired and mattress replaced but the next day it did the same thing. Not good maintenance. Once is understandable but twice? 2. The electric to the villa failed completely while we were at dinner. Maintenance responded quickly. Yea. The covers on the breaker boxes were missing on our villa as well as the next door unit. Could be a safety issue if kids should mess around over there. 3. The irrigation system uses recycled water. That is good but the water smells poopie and the smell comes into the house biggly. Not really a pleasant smell. This is a known problem and should be easy to correct. 4. There is no curtain or door between the bathroom and the bedroom which is a minor discomfort. Other than that, the location is great, villa roomy, beds comfortable when not wet, the beach is terrific and it is really close to a supermarket with great bread. We had a good time overall but they could pick up their game a bit. I know this might be the island lifestyle but still it was expensive. The condo was everything we needed, we especially enjoyed the outdoor living area. The staff were very helpful and friendly. The location was also good, easy to get around and only a short drive to downtown. We would definitely recommend staying at this resort.